Ebac Powerdri Review - Suitable For Home Or Work? The Ebac Powerdri definitely doesn’t follow the traditional white, grey or black colour scheme adopted by most dehumidifiers. Instead it sports a bright yellow finish and has a ‘work tool’ look to it; and wouldn’t look out of place on a building site in addition to the home. After doing some research we think we were right about this assumption and it appears as though Ebac have tried something a little different with this model. But what is it and who is this product aimed at? On checking we found that the Powerdri was made of a sturdy ABS polymer (Acrylonitrile – Butadiene – Styrene). This particular type of plastic is tough, rigid and has a high impact strength meaning it can deal with the daily knocks it is likely to encounter on a working day. And that is what Ebac have pitched this product as: a unit which is powerful enough for the domestic market and also strong enough to be used by tradespeople as they complete work in homes. In fact, Ebac have even stated this product is ideal for trade use and provided some rather specialized drying modes to help paint and plaster dry (more on those later). Outside the specialist functions this unit is much like any other refrigerant dehumidifier. It is quite heavy at 14kg so some people may find this a struggle to lift, particularly as it comes with no dedicated carry handle and instead has an indented grip hole. It is also about average in size for a unit of this type and is 54.5cm high, by 34cm wide, by 28cm deep. To remove excess humidity from the air this unit uses a refrigerant pump to cool a set of coils that condense and collect the water. This type of unit is prone to freezing up in lower temperatures and to help combat this Ebac have included an ‘intelligent defrost’ system which breaks down the ice. This is pretty much standard and all dehumidifiers of this kind. But what is not so standard is the the hydrophilic coating on the coils which allows this unit to collect up to 40% more water without the need for consuming more power. Making this unit very economical indeed. At some point all dehumidifiers will need its filter replacing. Some people have remarked that they cannot find any filters made for the Powerdri. This is because the frame of this unit is basically the same as some its earlier models as such it can accept filters made for those units. Filters marked as ready for DDA507 or DDA510 will fit the Powerdri. You can buy these filters here. The Powerdri is the next step up from Ebac’s popular Amazon range. As such the Powerdri has has some slight improvements made to its controls which makes the panel a little more self explanatory. The panel is very basic and is missing a few things we would like to have seen (more on these below), however this does make it really easy to operate. On the left is the fan speed dial. You can choose from ‘Low’ and ‘High’ denoted by one and two fans respectively. This is vast improvement over the amazon range which only marks this dial with a single and double dot, which is not immediately obvious what it does. The high speed fan setting makes the dehumidifier work a little harder to quickly dry very damp areas. The downside of this is that with increased power comes an increase in noise. At 46dB this is not the quietest refrigerant unit we’ve seen, but most of this type are typically a bit noisier than some of the desiccant models. If you’d like something much quieter we recommend looking at the EcoAir DD128 which can be operate at a much lower 34dB. The final control on the panel is another dial used to switch the machine on adn select the humidity level. Ebac have provided no idea of what humidity level the machine aims to hit and is not even marked with any ‘min’, ‘med’ or ‘max’ boundaries to provide some clarification. This is a little disappointing because the ‘wet finger to the air’ approach dictated by Ebac for its operation may not be to everyone’s tastes. Ebac state that you need to switch the machine up onto full and wait for the humidity to drop to a level you are happy with. Then you need to carefully turn the dial backwards until the machine clicks off. It should then maintain the relative humidity (RH) as it is – even though you have no idea what the actual humidity level is! On the upside it does provide 3 handy icons on the far clockwise position of the dial. These give some indication to its conception as being a domestic/work place dehumidifier. The first icon is laundry mode. A feature common to most dehumidifiers this effectively gets the unit to work harder to help dry your washing when it cannot be hung outside. The second two are more ‘work place’ in nature with the first being a roller which we assume to it help paint dry and maybe even to speed up plaster drying. The last icon is of a small house full of water we also presume this could also be to help plaster work dry and/or to speed up the removal of condensation/damp across the home. Although Ebac do not supply and explanation for these settings (that we could find) in the Powerdri’s manual. It was also disappointing to see there was no timer on this panel. Whilst not a necessity it can be a very useful feature for keeping a handle on the operating costs of your dehumidifier and it something most other units in the Powerdri’s price bracket supply and is something we feel is more of a standard feature on mid to top end units. Continuing with the theme of the simplicity, the only visual feedback provided on the Powerdri to indicate its operation is a small light which glows green (everything is OK!) and red (something is not OK!). Typically the red light would indicate the water collection tank is full or not inserted correctly. Ebac have provided a very nice online support feature for their clients: a dehumidifier diagnostic tool. This is a very nice touch allowing you to quickly find and diagnose any problems with your device and get it up and running again quickly. You do need an account to access this system but it is free and easy to setup. You can create your account here: https://www.ebac.com/shop/account/support.php. Ebac give a minimum operating temperature of this unit as 2°C. 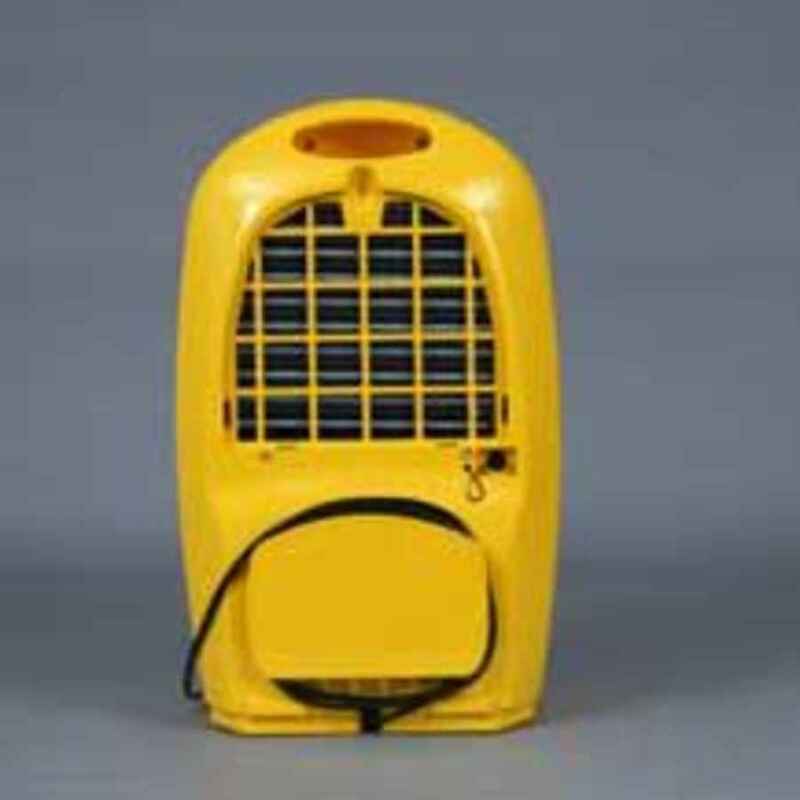 This means it is not really suitable for use in outbuildings or any location where the temperature can drop much below 10°C. It is more ideally suited within your home where it should perform nicely. 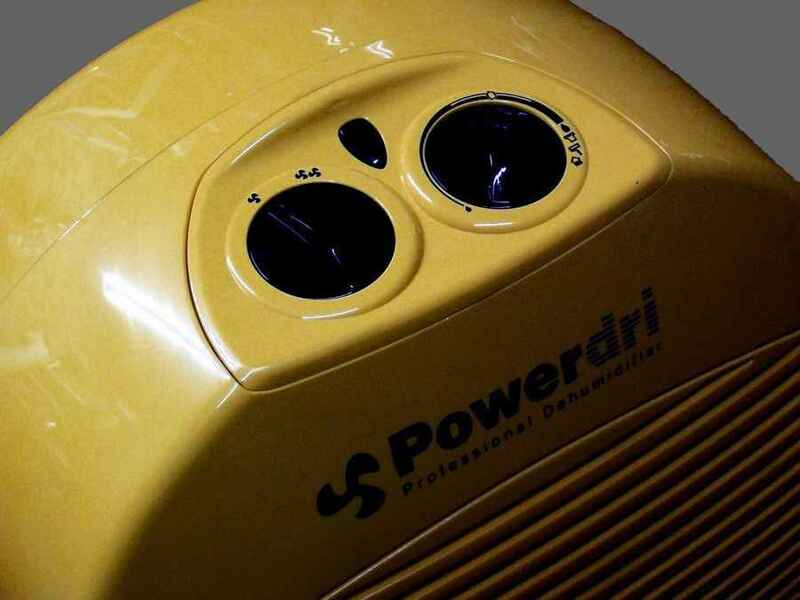 It is powerful enough to deal with condensation and minor damp across the entire home up to 3/4 bedrooms (180m² – 360m²) and, like most dehumidifiers, works best when used in a single room making it ideal to tackle major damp problems that are situated in one room. We mentioned that this device can work in most average sized 3/4 bed homes and this is backed by a powerful maximum of 18 litres per day water extraction rate – as quoted by Ebac. Ebac are a UK company who make dehumidifiers designed for the British climate so we believe this is a figure you can trust. Most manufacturers who also claim to extract this amount of moisture often test their units in very high temperature and humidity levels that we just never experience in the UK. This provides an over-exaggerated claim to the machines exact performance. And whilst we think you won’t ever extract 18 litres from one home in one day it does give an idea that this a powerful unit and should be able to deal with most common damp/condensation problems. Behind a flap in the front of the machine you can find the units rather large 3.5 litre water collection tank. The tank is a jerry-can style container which makes carrying and emptying really easy without the worry of spilling any water. The flap which gives you access to the tank does have a habit of falling open when moving the unit especially when the tank has some water in. This is disappointing given the sturdy build and high quality of the rest of this unit. It is hard to be unimpressed with the Ebac Powerdri. The build quality is fantastic and the extra energy saving features really help make this a reliable unit. It is let down however by the lack of extra controls that would allow you to fine tune the unit to your exact needs and the water tank flap which has an annoying habit of swinging open when you’re moving the machine. If you’re after a simple machine that is built well then this unit should meet your needs. However if you would like something a little more special, which still offers exceptional performance we recommend looking at the DC202 before settling on the Powerdri.